There is a battle going on in the selling battle field. It is a battle for eyes, especially in the hospitality and commercial real estate space. The way to win that battle is with compelling content to convert the buyer. It has to be great content and it has to sell by taking the viewer inside the experience or asset you are offering. Give them a reason to explore and engage and educate them to fuel their interest. We have a great “ultimate content studio” option for hotels to get a massive bang for their budget. In the past, marketers were able to get by with simple two dimensional images but the bar has been raised significantly. We go beyond a typical piece of media to get eyes on your presentation. We strive to always offer the latest technology to make your brand shine. Below is an our new power panorama offering and an example from a Caribbean luxury resort, Cap Maison in St. Lucia. They have been a leader in the hospitality space adapting to new technology using our drones and Matterport virtual tour technology to market their five star resort for over 3 years. In the power panorama example below we are using a drone panorama as the base with Matterport virtual tours, 8K 360 videos, standard video, virtual reality and a few other web based pages. 360 Video is all the rage right now and is gaining serious marketing momentum. 360 video playback is at a tough place because of lack of a consistent user experience across desktop and mobile. We’re using Omnivirt players exclusively for 360 video which blow away Youtube, Vimeo, JW Player and more. Omnivirt players are slick and the only 360 video player we have found that DOES offer a consistent experience across all devices and browsers which is rare. It’s important to note that all of these elements are presented inside the base panorama and do not take you to external apps to view them. This is a tall task in the current state of mobile developing. This multi media experience is the SAME across all devices whether desktop or mobile. Drone Panorama – This panorama captured with a high end drone and professional stitching software is exhibiting a grand scope of your offering and serves as an amazing template. You can zoom in and out of areas and notice the crisp clarity. It is also possible to have several of these panoramas where a user could click between different views like maybe from the four corners of a property. Virtual Tours – Virtual tours have changed the game in hospitality and commercial real estate. You can be there without being there. These tours breed immediate familiarity while the viewer discovers a lot about the actual space. 8K 360 Videos – This is the same type of 360 degree view you might see when you spin around inside a Matterport virtual tour but on steroids. This video gives you a full 360 perspective with “live” video where you see and here everything as you would if you were standing at that exact spot. “8K” is referring to the resolution that the video is captured at which gives you insanely amazing sharp video as opposed to consumer cameras. This video is captured with six 4K cameras simultaneously capturing the environment. It is also possible to add a host, graphics and special effects. To give you an idea of the post processing strength needed, a one minute clip can be over fifteen GIGAbytes in size. Massive. The implications on hospitality and commercial real estate marketing are huge. 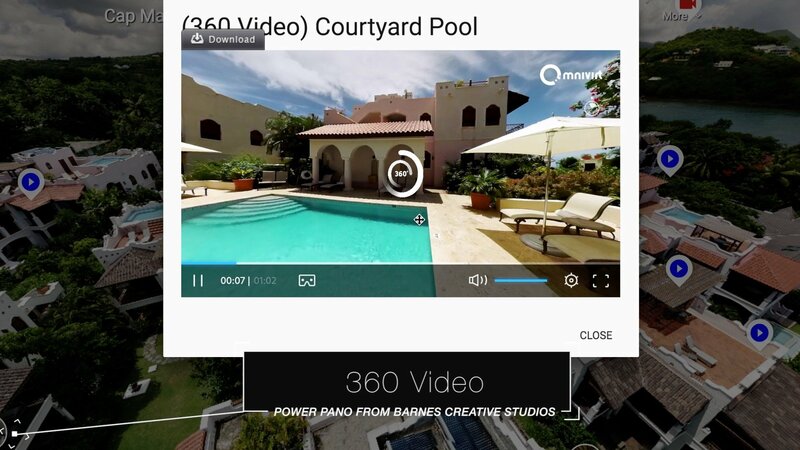 There is also the possibility of adding hotspots within the 360 videos that can take a viewer anywhere from a page to “buy” or even jump to a different 360 or standard video. The options are endless. Standard Video – Standard video very much still has a place in story telling and is just as important as all the flashy new options with multi media. In this case, we have everything from “The Story of Cap Maison” to underwater video showing how amazing the snorkeling is at Cap Maison. Click around and watch a few of these short videos and you’ll be amazed at how much you learn about and get interest in this resort. Put yourself in the shoes of a buyer…it’s giving a self guided user experience that could go on for hours. Virtual Reality – If the user is on a cell phone and has VR glasses (which are coming even further down in cost) they can pop their phone into their VR glasses and instantly get a virtual reality experience from any of the Matterport virtual tours or 360 videos. This can also be huge for hospitality or commercial real estate brands who want to take their asset on the road. Imagine being able to hand over some VR goggles and submerging someone in your “place” immediately. Other Stuff – While you don’t want to overload the viewer you can also embed web pages or other static content. In this panorama we’ve only included a “book now” option. This can be powerful since this one web link can “live” alone on the web and a user could book a trip without ever leaving the panorama. The beauty of this new offering for hospitality and commercial real estate is that it is scalable in regards to your budget. You could easily create the base with a few media elements and grow that over time to have an abundance of media. Don’t forget you can also use all of these media items by themselves in your social media which could lead back to your website or even back to this panorama. We’d love to help you create a power panorama. Contact us for more information. Content Marketing is the fuel that drives a successful website. We can help you orchestrate a successful video content strategy. Read More. Barnes Creative Studios is the premier commercial real estate and hotel video/new media producer. We bring 25+ years of storytelling experience to your brand using state of the art cinematic technology. Services range from standard video production, professional drone video, Matterport virtual tours, branded content for television, 360 video, virtual reality, creative new media and more. We provide services to commercial real estate, hotels and hospitality, residential real estate, television and brands both large and small.